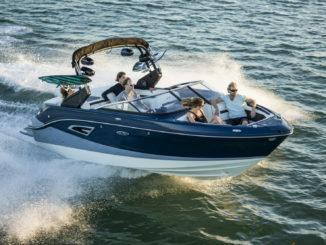 The little brother of the RZX3 concentrates all the latest technologies and innovations developed by the American shipyard with one goal: to offer you the best wave possible. So, marketing promises? or successful bet? Tigé continues to progress and to do so very quickly. Growth that does not leave anything to chance because each manufacture year brings novelties and innovations. 2018 is no exception. The RZX series now comes in two sizes, the RZ3 (23’) and the new RZX 2 (22’). Rewarded by the nautical world, the RZX2 offers almost all the benefits of his big brother, but with 12’’ less and a more accessible budget. 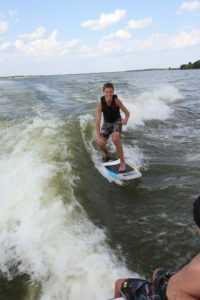 However, the RZX2 is still designed as a pure watersports machine used for wakeboarding, wake-surfing and especially fun. Visually, the RZX2 reminds one of the RZX3 with its famous trident nose which accentuates the visual effect of width and offers more space in the bow rider while protecting the crew. The rather high and very tight bridge line gives at once an impression of robustness and sportiness whereas the rear evokes force and power. The graphics are, of course, available in several versions and new colors have appeared in the 2018 collection. 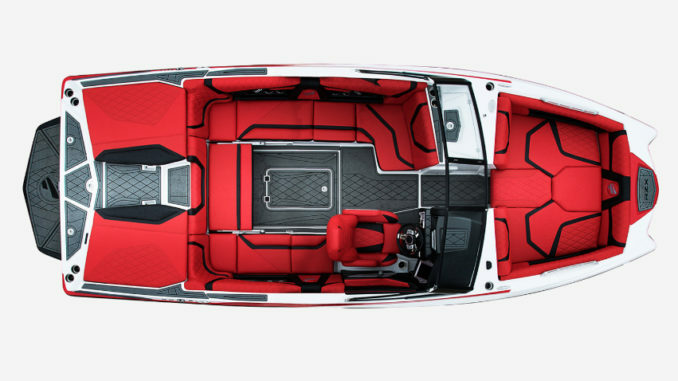 In fact, the customization possibilities are so important today that it is rare for two identical boats to come out of the factory. On the rear section, the swim platform is large enough for all the nautical activities and if you wish, it can receive a specific coating. 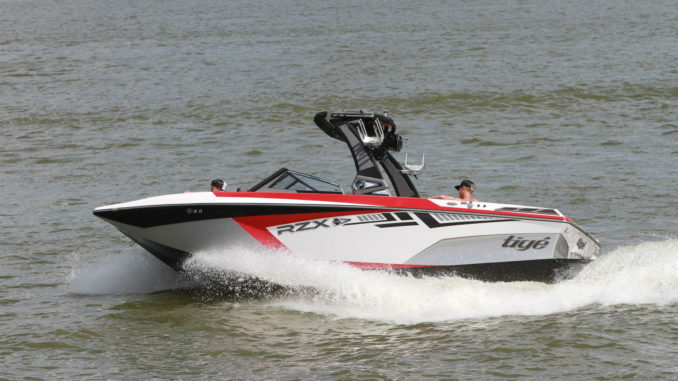 Finally, the new Wake Tower “Alpha E2Tower” adds a very sporty finishing touch. Taking advantage of a nice design, this tower also has the advantage of being foldable electrically. Finally, the interior lighting of the tower gives it a beautiful effect, and it harmonizes even with that of the speakers! A very nice detail. You can also add a new bimini, more rigid and easier to deploy, and to complete the set, the new 10’’ speakers are also available. The cockpit is fairly conventional with a layout that offers lots of conviviality thanks to the seats that almost completely circle the cockpit. As a bonus, a lift-up seat on the port side allows you to form a “lounge chair” and you can buy an optional mobile central seat that offers the possibility of sitting and looking ahead or being in the rear section keeping an eye on the rider. While attractive on paper, this option occupies the whole place in the center of the cockpit. 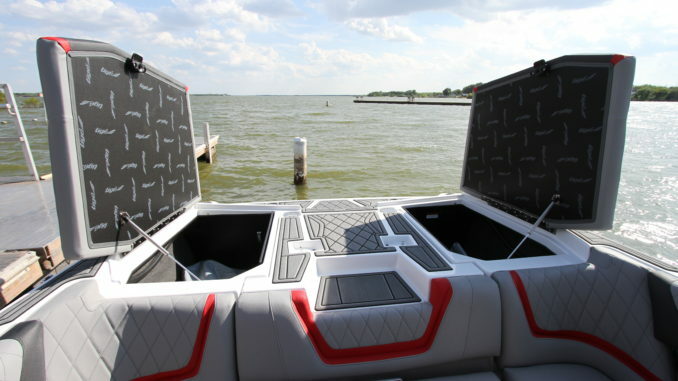 On the front, the bow-rider offers a good size solarium (48’’ x 63’’). If the central part can be removed, there is, on the other hand, only a very small storage box on the front which can, if necessary, serve as an anchor box. The rest of the space is occupied by the ballasts. 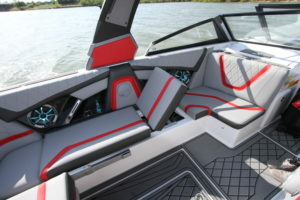 Some good points are the handrails, very practical for the separation between the bow rider and the cockpit, pleasant when the temperature begins to freshen up. You can also choose the heating option, a real plus for combinations or just to warm up a little after a ride. Under the seats there is a lot of storage and particularly the one hidden under the console port has a larger mirror for riders concerned about their look. It’s a pity there is no system to keep the hoods open. 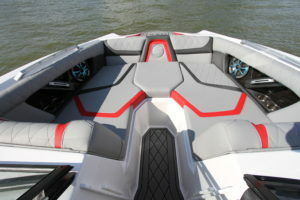 Storage can also be found in the floor and more on the rear, on either side of the engine, just above the soft ballasts or completely on the stern to store the ropes and other wet accessories. It is also here that you can find the sunbath to get into the water or just to enjoy the sun. In addition, the central cushion can be removed to release a passage between the cockpit and the swim platform. The driver has not been forgotten since he/she benefits from new luxury seats which are more comfortable and ergonomic. The captain can also enjoy the new steering wheel with integrated controls on a central part that does not turn as on some cars. There are still some details that make all the difference such as the support for the phone and the redesigned dashboard. 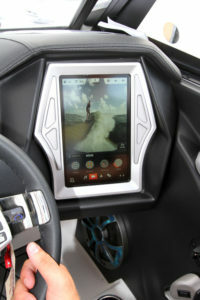 This driving position is also free of all buttons since it incorporates the 10.6’’ vertical touch screen. “Tigé Clear” was previously only available for the RZX3. 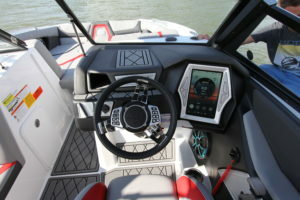 This screen makes it possible, like a Tesla, to control almost all the boat’s systems with your fingertips. In addition to the guaranteed visual effect, the system offers a very intuitive interface that can be assimilated in a few minutes. From the touch screen you can control the engine parameters, fill or empty the ballasts, activate the Zero off function or save the profiles of several riders and their parameters. The audio system is another cool feature which can also be controlled by this screen just like the camera that is now integrated in standard into the strake. To sculpt the wave, the Tigé uses a patented hull called ConvexV Hull, which improves the flow of water to naturally create a wave. The RZX2 also incorporates the third-generation TAPS system developed by the brand. Specifically, it is a set of three movable flaps controlled from the dashboard to increase, reduce or guide the wave on one side or another according to the desires of the rider, his level and the activity. 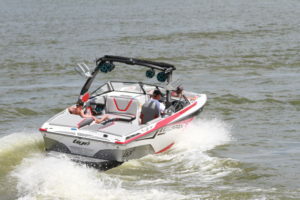 Added to this is the Surf + Wake XL Ballasts, an assembly carrying 2 700 Lbs of ballast that can be filled in 5 to 10 minutes. If necessary, you can also add 1 200 Lbs of additional ballasts. This combination of different technologies (hull, Taps and ballasts) is deep and firm enough to allow for an excellent wave, deep and firm enough. This boat is also well made and the level of finish more than correct with real attention to detail, especially on upholstery and painting. 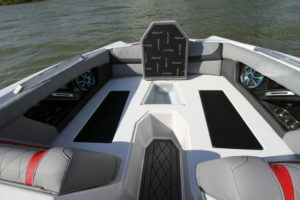 Finally, the boat is already well equipped in standard and the options allow you to customize your boat easily. 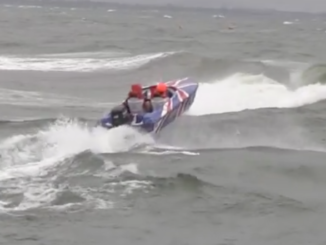 The RZX2 is available with a range of engines from 400 hp to 575 hp (440 hp to 575 hp in Europe). All these engines come directly from the famous Ford Raptor and are marinized by Indmar. During our test, we had the “small” 400 hp, a valiant motor but a little insufficient to leave a rider or two with real comfort. 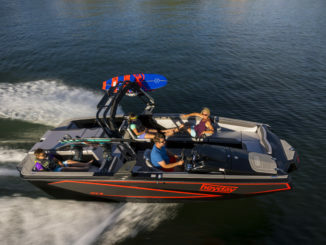 However, this year, the RZX2 has a new 2:1 transmission that offers more torque and allows to take a larger propeller. Another novelty is the “Fresh Air Exhaust,” an angled exhaust system that redirects emissions and vapors into the water rather than dissipating them in the air, a real plus for comfort on board. Neither too short nor too long, well motorized, easy to carry and well equipped, the RZX2 also includes the latest technologies available in the world of watersports. 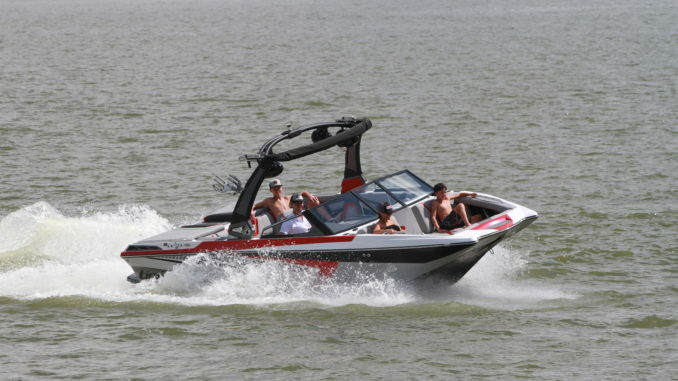 In short, it is a beautiful machine dedicated to wakeboarding, wake surfing or just fun. A kind of water-sport coupe.